In a wide-ranging and challenging conversation, Donald Trump’s former strategist tells GQ‘s Ben Schreckinger why the #MeToo movement amazes him, why the Chinese enrage him, and why his secret new venture—a project to “weaponize ideas”—excites him. Steve Bannon has been thinking big thoughts. 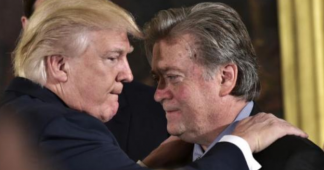 Though he’s stayed largely out of sight since the publication of Michael Wolff’s Fire and Fury, Bannon has been in high demand in recent weeks. He appeared, behind closed doors, in front of the House Intelligence Committee and is said to have given Robert Mueller some 20 hours of his time as well. What he told them, of course, remains unknown. As does the path ahead for Donald Trump’s erstwhile strategist. 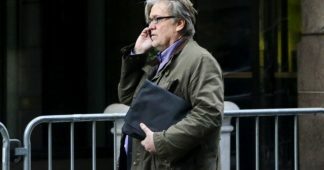 These days, he no longer runs Breitbart News, but Bannon remains holed up at the townhouse that once served as its Capitol Hill headquarters, plotting the next stage of his right-wing populist revolution and brooding over the course of human events. That’s where, on a recent Saturday afternoon, I found him—wearing a beige-khaki shirt over an orange polo, the collar down on one side and popped on the other. 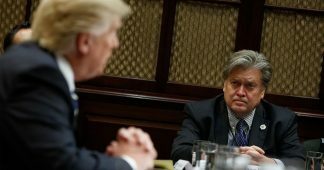 Amid the clutter sprawled in front of him on the dining room table at Breitbart’s townhouse lay two totems of his current thinking. One was a copy of The New York Times, showing coverage of the Women’s March protests that greeted the one-year anniversary of Trump’s inauguration. He’s been studying the movement closely, he explained. The other was a sheet of paper on which he’d sketched a triangle, labeling its vertices China, Persia, and Turkey. 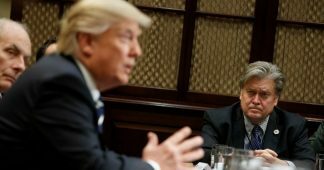 Invoking the 1930s and ’40s, Bannon told me that he believes the triumvirate is forming a “new Axis,” one that he thinks the U.S. and its allies must confront and defeat. 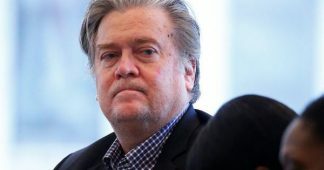 In the wide-ranging conversation we shared, Bannon declined to address the status of his relationship with Trump or with his onetime patrons, Bob and Rebekah Mercer, who have severed ties with him. In fact, when the conversation turned to the Mercers, he cut it off, but not before he had offered a stern defense of his worldview, a reflective perspective on his time in the White House, and a cryptic glimpse of what he’s planning to do next.